I’m a middle school principal, and all my hunts are 3-day hunts. I leave on Friday afternoon, hunt Saturday and Sunday and sometimes on Monday. Then I’m back at school. 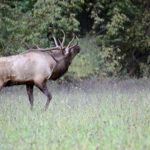 I average guiding about seven hunters for elk season. 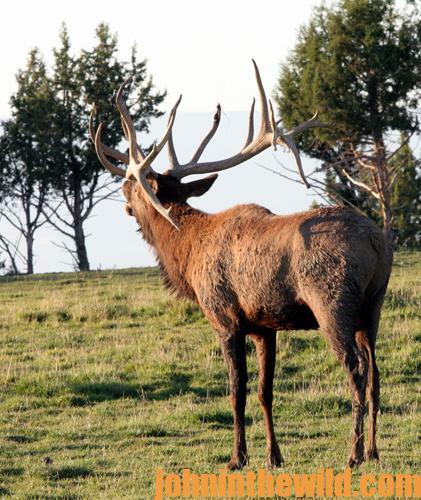 So far, we’ve been 100 percent on taking bull elk. 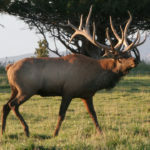 Primarily, I hunt in the Gila National Forest (https://www.fs.usda.gov/gila) and the Lincoln National Forest (https://www.fs.usda.gov/lincoln) in Cloudcroft, New Mexico. 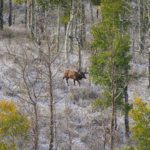 In the Lincoln National Forest, the bulls will score 300 to 320 Boone and Crockett points, and we’ve harvested some bulls that have scored 360 points. 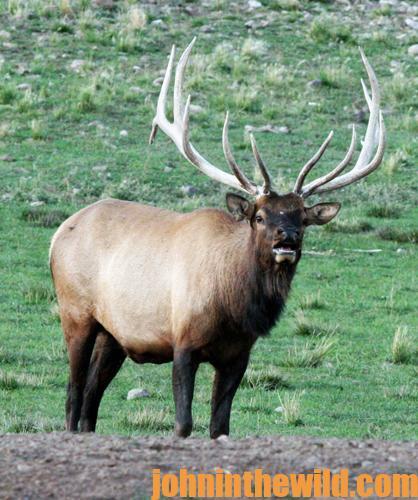 This unit is known for seeing numbers of elk. In the Gila National Forest, we normally take bulls 340 to 360 points and even one 390-class bull from the Gila. The biggest bull I’ve ever called in scored 397 and was the strangest hunt ever. I was hunting in the middle of the day with a couple of friends, Billy and Michael Salopeck from Las Cruces. We were walking back toward our truck, and I was calling every now and then. We heard this bull crank up like he was a freight train. 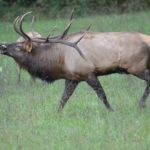 Immediately, we started moving in on the bull that was bugling, growling and chuckling so loudly that another hunter also heard the bull while riding his ATV on a little two track road. He pulled his ATV off the road, parked it and moved into the woods about 25-yards from where he’d left his ATV. I set-up both of my hunters to get shots at the bull as I began to call. 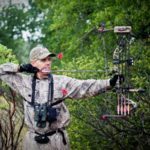 We didn’t know it, but the other hunter – a bowhunter – was about 75 yards in front of us when the bull walked by him. He released his arrow and hit the bull that then walked up to about 20 yards from both of my hunters. Both men drew their bows. But before they could release their arrows, the bull fell down stone dead right in front of them. I walked up to my hunters and asked, “What in the heck happened here? 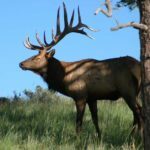 Did the bull have a heart attack?” By the time we walked up to the bull, we saw the other hunter coming to us, who said, “Hey, that’s my bull.” The hunter who had shot this beautiful, gorgeous bull was Craig Cooper from Silver City, New Mex. Since Cooper didn’t have a knife with him, we helped him skin and bone-out the bull and get it to his ATV. So, I called in a 390 class bull to my hunters that Craig Cooper shot before the bull ever reached my hunters. 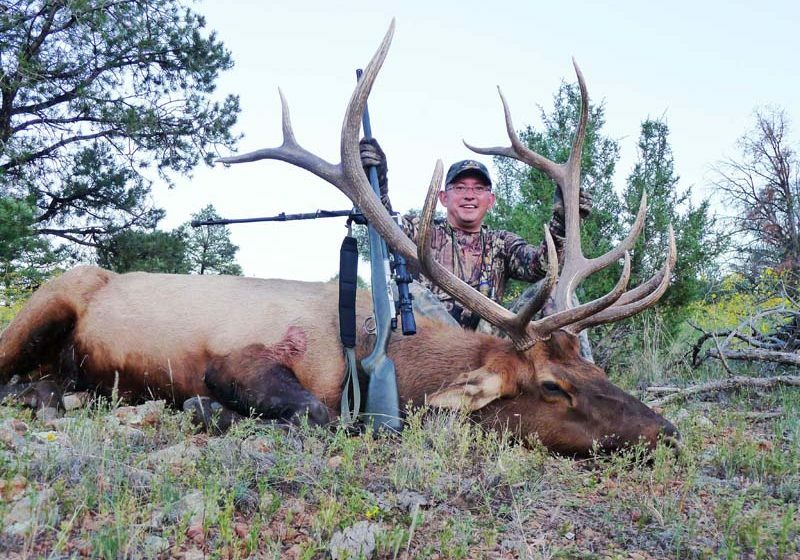 That’s the biggest bull I’ve ever called in and one of the strangest hunts ever.